The trouble with saving the world is, it never stays saved. It’s an ongoing, largely thankless, Sisyphean endeavour that’ll either break your heart, your body or your soul, or in most cases all three. Which is why the Avengers go through so many members as, in an ironically reminiscent of Hydra sort of way, when one falls, two spring up to take their place. Thankfully, during their seemingly unwinnable war against the Dark Celestials in which the fate of the world was ultimately decided by the Spirit of Vengeance, Ghost Rider, and the origin of all life on Earth was finally revealed, none of the Avengers newest recruits perished and so in World Tour Earth’s Mightiest Heroes stumble into another day and another crisis that could, potentially, end civilisation as they know it. 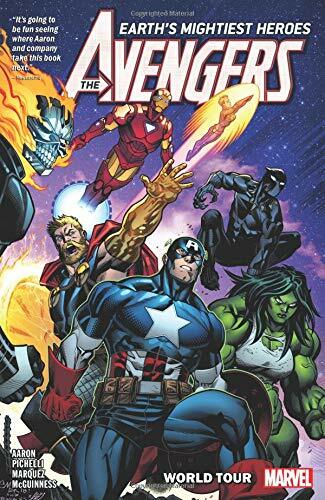 This time around, the threat is far closer to home as having decided to become a neutral power and global citizens as far as world politics are concerned, the Avengers not only have to face to the wrath of Namor and an Atlantis ravaged by the Dark Celestials affair, they also have to contend with the formation of both American and Russian super-teams whose sole purpose is to defend and guard their national interests before all others. Having elected Black Panther as their new chairman and set up a multi-national network of agents, the Avengers become the de facto defenders of Earth, a role that in future will no doubt see them not only protecting the planet from all manner of galactic threats, but also from itself and those deluded and deranged souls who would seek to subvert and threaten it from within.